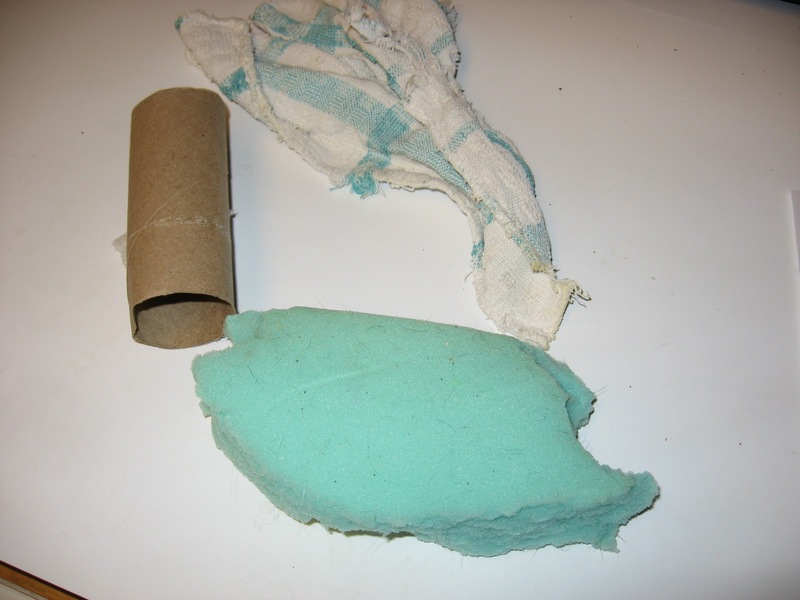 Question: What do these things have in common - foam chunks, empty toilet paper rolls, old envelopes, empty facial-tissue boxes, and old rags? Answer: My daughter. My daughter has been in to recycling and re-purposing since she was old enough to walk. I often didn't understand that her "masterpieces" were more than just trash that she was ferreting away. Every so often I have to go through her room and haul out piles of "recycling" - if I didn't her room would be piled to the ceiling with trash! But as exasperating as it is to have a pack-rat in the house (who's worse than me! ), I think it is AWESOME that she loves to recycle! This week's pile is apparently going to make a water-filter so she can help save the salmon. I'm not sure how it's going to all work (and I don't think she is either), but isn't it great that at age 9, she's already trying to figure out ways to save the environment?! Perhaps all those "Bob the Builder" movies we watched when she was younger, had a positive affect on her (reduce, reuse, recycle!). Cheers to the future generations!! Hopefully they can fix what previous generations have broken! Every October, as I walk through the grocery store or other retailers, I am reminded of my mom (she was one of the many victims of breast cancer). I think my mom would have been impressed at how much is being done to raise awareness and money for research. I miss my mother so much - and I wish she could be here to witness all of the amazing improvements that have been made. I do my best to support those companies and I am reminded that I too, need to make sure I have my mammograms. I schedule mine around the October time frame - it's a great way to remember to have it done! As a way of honoring my mom and helping to fund cancer research, a portion of our sales on Etsy this month will be sent to the Susan G Komen Foundation. Right now we're in the process of creating some new seeded-paper items - of course some will be pink in honor my my mom (love and miss you mom!). My love and prayers go to all the women fighting breast cancer (and to their families!)! I love it when I get a new inspiration for items that normally get tossed away!! http://upcycledstuff.blogspot.com/ has a fun posting about used dryer sheets. 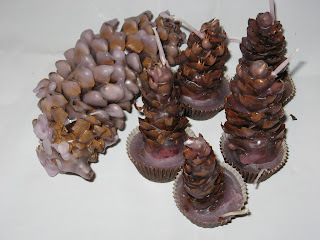 When I read her post, I realized that I could actually be adding my dryer sheets to help make the base of my Pine Cone Fire starters which I sell on Etsy! Great idea! Thanks Upcycled Stuff!! My fire starters are already made from 80-90% recycled and found items (partially used candles and old crayons go into making the wax, leaves, twigs, pine cones, wood chips and dust from other craft projects, and dryer lint all go into the base of the fire starters). Even the wicks are from old candles or from old string rolls found at garage sales. -The paper nut cups or paper mini-cupcake cups (and so far I've found enough of those at garage sales that I haven't had to buy any new ones!). -The ribbon I tie the bags with (and most of that is also gotten at garage sales and thrift stores). -The basket-filler materials (although I have found most of mine from friends and family who were throwing theirs out). I use only paper-based or wood-based filler in my bags and baskets. In fact, my fire starters are packaged with the paper-based basket filler and is meant to be used as part of the fire starting base! -The only truly new thing I have to buy is the cellophane or polypropylene bags that I use to package the Fire starters in. 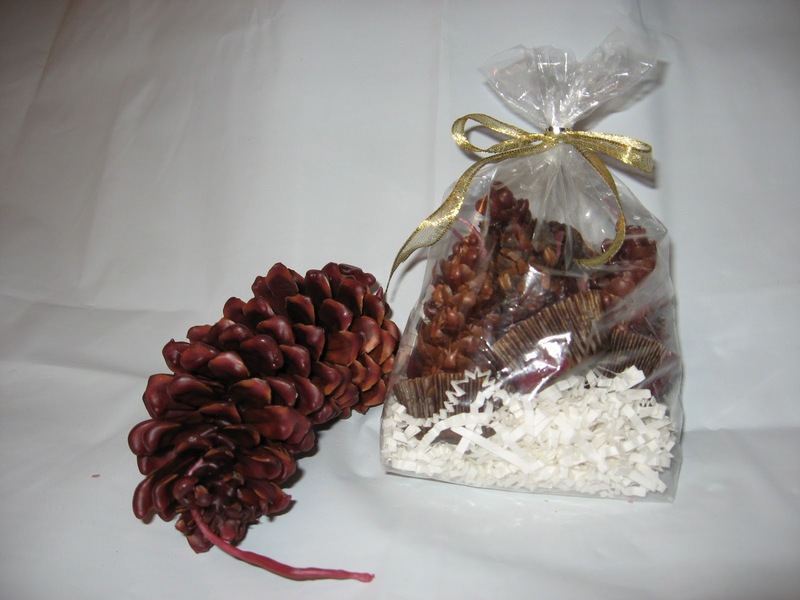 *Did you know that cellophane is compostable since it is made from cellulose which is from plant matter, and that polypropylene is accepted by many recycling companies - you can just add to your recycling bin (please check your local recycling rules before doing so!). 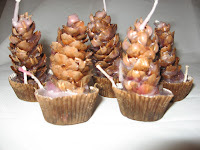 My daughter and I are planning on making a new batch of fire starters this weekend - with a holiday theme (think pine-cone fire starters that look like decorated Christmas trees!). I'll definitely give the dryer sheet idea a try! Thanks again Upcycled Stuff! How do you decide which items to save and which to donate or toss? So I just finished going through about a bazillion things in my garage and I am now looking at a huge pile of items that I either need to toss, donate, sell, recycle, or upcycle. I am so torn because most of the things in those piles, are items that I can see lots of possibilities of usage. Oh - and I HATE getting rid of things that I see potential in!! But I have only a small amount of room for storage - so I have to eliminate something.